Good Japan beaches are hard to find. Beach season in Hokkaido starts from late June until late August. If you go to the beach before or after this time all the shops, food stalls and bars will be closed and there will be nobody on the beach, even if it is a perfectly hot sunny day. The Japanese will only go during “beach season”. I went one time to camp out over night with a group of friends at the beginning of September when it still felt like summer and the beach was completely deserted. All the shops had been bordered up and there was not a soul there apart from our small group. The Japanese do not go during the Obon (festival to worship ancestors) holiday because there is a myth that the dead come to the living world from the sea and if you were to go to the beach, you will be dragged to the underworld never to be seen again. However, these days young people don’t believe in this myth but the beach will be very quiet at this time (August 15-17) because most people will be visiting their ancestors graves to pay their respects. Japanese people love to barbecue and the beach is one of the best places to do this. They take everything from large tents, to gazebos, portable tables, chairs, beer kegs and camp out all day and some even stay over night barbecuing and drinking until the early hours. I highly recommend this. Some people will bring music or play it from their cars so it feels like one big beach party. A popular game to play at Japan beaches is "suika-wari". Suika means watermelon and wari means to crack. Can you figure out the game? One person is given a bat and blindfolded. They are then spun around a few times in a circle of people and then guided by the surrounding people’s shouts to find the watermelon. They get one go to crack the watermelon open and then it’s the next persons turn. The person to crack it open wins and then everyone shares and eats the delicious summer time fruit. Watermelon is by far my favourite fruit. At night, you will see many people playing with fireworks. Fireworks are very popular in Japan and are relatively cheap to buy. Seeing the beautiful colours at night is a great way to spend an evening with friends. A lot of Japanese women like to have white pale skin and do not like to tan because it is considered beautiful to be white in Japan. Also in the past it was a sign of high class because rich women could stay indoors away from the sun whilst the poor had to slave away outside under the sun. 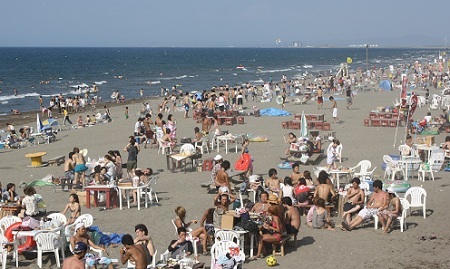 Another reason which I often get from my Japanese friends is that they don’t want to get skin cancer or wrinkly, leathery skin when they get older, so they avoid Japan beaches like the plague. Some even say they hate the beach! Who can hate the beach? As a result, many Japanese can be seen completely covered up, from head to toe, in the summer or using umbrellas to shade themselves. The younger generation, however, think that tanning is more beautiful mainly due to western influences and western fashion magazines displaying their favourite sun tanned Hollywood actors. Therefore, you will notice more young people down the Japan beaches than old people. There are a couple of nice sandy beaches around Sapporo city. 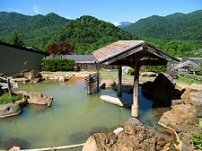 The most popular Japan beach is Otaru Dream Beach . This beach is a proper party place mainly visited by young beautiful people and has many bars along the side. The sand is a nice browny grey and the sea is a little murky but clean. It’s such a friendly lively atmosphere, (maybe because most of the people are drunk). I was with my friends from the UK and we were stopped by different groups of girls on three separate occasions. Granted, they probably only wanted to practice their English but they were really fun. Ranshima beach is a quaint and very beautiful beach located in a cove surrounded by mountains and trees with light brown sand and clear, clean water. It reminds me of some of the beaches in Thailand and therefore Ranshima is one of my favourite Japanese beaches in Hokkaido.